Lawson Aviation, LLC is an internationally recognized engine facility specializing in the overhaul of Continental and Lycoming Engines. They began their operations in Gobles, Mi over 40 years ago. Owner Dustin Lawson purchased this family owned business from his grandfather 4 years ago and wanted to move it closer to his home and roots in Three Rivers. 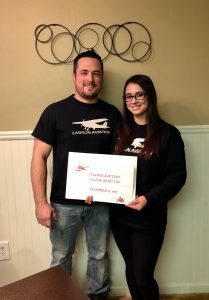 He and his wife Ashlee purchased 3 acres in the Airport Industrial Park, near the Three Rivers Airport in which they will build their shop and offices. The company currently has two employees, Dustin and his brother Jordan and services engines from across the United States and overseas as well. Christy Trammell, President & CEO of the Three Rivers Area Chamber of Commerce who serves for the Industrial Development Authority stated “we were very pleased to assist Lawson Aviation with the purchase of the land for the next phase in their company and look forward to seeing them grow here in Three Rivers. This is the type of business the City of Three Rivers had in mind when this park was developed”. Lawson Aviation plans to be operating their business in the new location by the Spring of 2018.